In our industry, the term “archival“ is used to describe materials and processes that do not harm the artwork. Archival framing greatly diminishes the rate of deterioration of even the most fragile works of art while also shielding them from environmental risks. At Hirsch, we use only the finest archival-grade materials and esteemed processes. From UV-filtering glazing down to house-made rice starch paste, every frame component is selected based on its ability to preserve the artwork at hand. We frame using sound and proven techniques to ensure that the artwork is in no way altered as it is being framed, and that everything is completely reversible. We see framing as very much about the integration of design and function. We would never choose to protect an artwork in a style that is at the expense of its design, nor would we ever design a frame that compromises its level of protection. Inside every frame we build is an enclosed chamber of preservation that ensures an artwork is never exposed to environmental changes that can cause damage, such as dust, moisture, pollutants, and harmful UV-light. Different mediums respond differently to environmental conditions, so the type of protection that’s best for each piece varies also. Drawing on our deep knowledge and understanding of artistic mediums as well as our decades of experience, we are able to determine the most appropriate methods and materials for virtually any project. Asia Society approached Hirsch & Associates to build a frame for F.N. 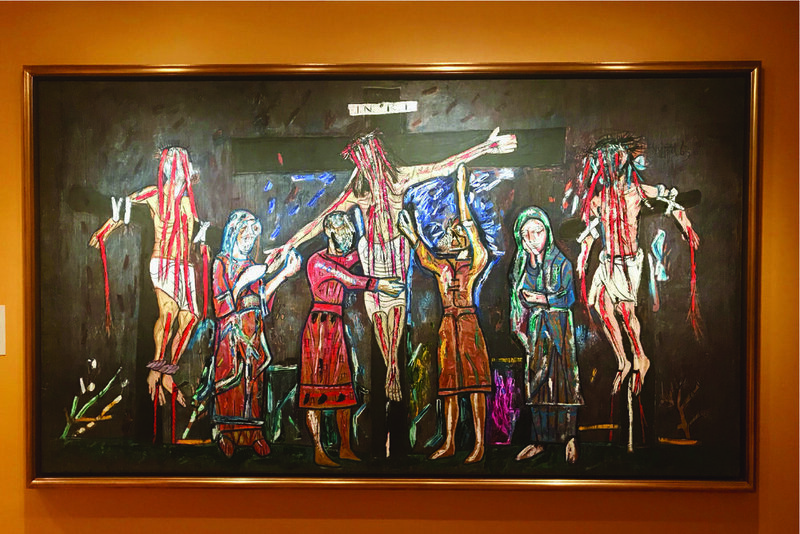 Souza’s Crucifixion for their exhibition Season of India, which opened in September of 2018. Due to the scale of the artwork, the frame had to be assembled and the painting fit onsite.